Edgecomb Gray or should we call it Edgecomb Greige? With Revere Pewter ruling the roost for the past few years, there has been one gray that has been lying under the radar, waiting for its day in the sun – Edgecomb Gray. Edgecomb Gray – What colour is it? That is a good question. Edgecomb Gray skirts both the gray and the beige world, tucking itself quite comfortably into the greige range. In some lights, it leans slightly more to the beige side, while in others it leans a touch grayer. Overall, Edgecomb Gray is a relatively light paint colour, without being too washed-out. Great for a fresh, but slightly soft, warm and organic look. Now a lot of greige paint colours pick up a slight taupe/purple/green undertone (SW Repose Gray / Benjamin Moore Revere Pewter / Sherwin Williams Collonade Gray) which can be beautiful, but when I have clients looking for a softer, warmer greige, Edgecomb takes a different approach. Edgecomb Gray has an almost creamy feeling to it and doesn’t have the sneaky undertones that many other greige paint colours have. This creaminess adds warmth and softness, particularly in rooms with northern exposure or shadowed corners. And it adds this warm cream touch while still holding itself as a pretty solid greige – looking slightly more gray in some lights and more beige in others. Just keep in mind that subtle creaminess (slight yellow look) can show up in the odd spot – but it’s nothing obnoxious or OVERLY noticeable. The LRV of Edgecomb Gray is 63. So it isn’t a typically ‘light’ colour, but it certainly is a lighter colour that won’t feel too weighted in a darker room. Comparing it to Revere Pewter which has an LRV of 55, you’ll see that EG has more of a fresh and bright look. In a well-lit space, you can expect Edgecomb Gray to look lighter and brighter as the natural light bounces off of it. This will create a low-contrast and soft look. In an area with more shadows, Edgecomb Gray has a bit more body to it and tends to look slightly more beige than it does gray, while still being an overall ‘greige’ paint colour. Not sure which gray is best for you? Check out my affordable Color Consulting Packages! BTW, this entire home was built by James Northrup, a fantastic builder in Nanaimo who is available for spec or custom homes! Want to learn about some more great gray paint colours? Wonderful, I would LOVE to see some photos when it’s all done! I love your blogs and you sense of humor! I wanted to update my family room with a warm, beige tone and my designer suggested Bleeker Beige, but the sample looked like baby poo on my walls! So, she suggested Edgecomb Gray, saying it would be a better choice, so I went with it, even though the sample seemed gray to me. She was very confident I’d love it when it was on the walls. The painter finished three days ago and it is not what I hoped for. It’s very much on the gray side, sometimes greenish looking, but definitely NOT warm beige I had fantasized about. I see you told another poster about BM White Sand and that looks like what I had in mind, but who knows really?!. Do you think one coat would cover the Edgecomb Gray? So so excited to see your color review here…a new one…yea!! I could read your color reviews all day long, no one does it better…lol! Seriously though. I particularly love neutral color reviews because neutrals can be so darn sneaky, especially the grays and greiges. Thanks again! Thank you Tanya, what a nice note to get! And yes, they can be a real bugger to figure out, can’t they?! Hi Kylie…I just want you to know — I LOVE your website!! You have done an amazing job on Pinterest pulling in readers !! Any paint color I search always leads me to your site…so I wanted to let you know that what ever you are doing is working!! We just bought our dream home – a 5300 sq foot craftsman home. The lighting is a bit off though. I am trying to stay true to the craftsman theme (yet update the color palette) – but with the mid tone oak floors and moldings – its been hard to update the colors. I really want to go gray…but the ALL grays I have tried pull purple in certain areas (and I am not making that mistake again). The living room in the house has bm Stone Hearth which I want to keep…but that color looked so muddy and purple in the hallways. After reading all your suggestions and trying out about 10 samples (I should have just hired you! )…I am going with Grant Beige…its seems to be warm enough – yet not too Beigey or yellowey. I am also doing Revere Pewter, Gray Owl and Grey Cashmere in the front of the house. I will have to send you some photos. Anyways…just wanted to thank you for being a great source of information!! Have a great day! Awesome post. Love edgecomb gray. Painted my living room with it. You did a really great job of dissecting and explaining the ins and outs of this color and a few others. I love revere pewter as well. Used that in a few rooms too lol. I love learning new things about color. Especially my faves. Thanks!! Great review – this is one of my favourite colours! Wish I had found your blog 20 pint paint samples ago. Thanks sooooo much for that post on LRV. I also appreciate, so much, the color reviews in which sorts of rooms and colors work or don’t. Who does that? No one! You! Really helpful. I love your reviews and refer friends and family to your blog because you do such a great job of breaking the colors down. We’re working on covering up some pretty wild paint colors in our new home… lots and lots of color. Our master bedroom has 4 different easter egg colors alone! We painted our living room Revere Pewter and love it enough that I thought we would use it throughout the house until I read more about undertones enhancing undertones. Our kitchen has cream cabinets that have a slightly reddish antique finish on them and I think the Revere Pewter’s green undertones will bring out the red/pink of the antiquing on the cabinets. I also don’t want to make the cream look more yellow. I’m still trying to wrap my head around what undertones to use to downplay the red/pink/yellow undertones. If I understand right, opposites enhance each other. Would that mean that you’d use similar undertones to downplay each other? I’m thinking a greige like Edgecomb might be a safe pick in this case… what do you think? I used Edgecomb gray vs revere pewter in an averaged sized dining room. The room gets morning sun and remains beautiful throughout the day. I love it in the evening with different types of lighting . Have received many compliments from company about how pretty the room looks. Now try to decide if the living room should be the same color or now revere pewter. Gets plenty of sun as it’s a western exposure. Love reading your blogs! Hi Ruth, I’m so glad to hear you are getting compliments! Yes, I would pair Edgecomb Gray and Revere Pewter, absolutely! They are both neutrals and sit well together! And if you have time I’d love to see some finished pics! I was wondering if Modern Gray SW is comparable to this? I already have untinted SW paint is why I ask. I am thinking about painting my walls in this color but do you think that would compliment granite that has brown tones/specks? It is currently warm tones and I’m trying to make it more of a blend with grays (so I guess griege). Thanks for the post! Hi, thx for this helpful review — I have used this color in the past and loved it!! Do you know an equivalent color in SW, with similar LRV? My painters will be using Sherwin paint, and I’m apprehensive about how the color matching will turn out! and I have travertine flooring. would you recommend the edgecomb paint for an area like this? I have a family room area that is south facing and was thinking the revere pewter..would love to hear your thoughts! Hi Lindsay, thank you for your note! When it comes to personal questions, I do need to refer to my E-design packages, so that we can do a questionnaire/photos and I can get a bit more personal with your home. I try to give as much info as I can with my blog posts and if that doesn’t work, sometimes it’s time for a one-on-one! Your description of Edgecomb Gray and in what scenarios it would work best was spot on! It is the perfect color for my new home with its lighting and exposures. You have taught me so much about color. Thank you! That’s what I like to hear Kim, thank you! Hi Kylie…I am so glad to have come across your site. The information you have provided about Edgecomb Gray is what I have been trying to find for weeks. I love the color & purchased a pint sampler to test it on my walls but I find it too gray & light. It doesn’t seem to match the color chip from Benjamin Moore & I would really like to get what I see on the chip. I want the Greige effect with more of the creaminess towards the beige. Would I be making a mistake to have them adjust the color when they mix it up in the gallon cans? Thank you! And I really appreciate any feedback from you. I’m using Edgecomb Gray for a large north facing open concept living room, dinning area and kitchen with a lot of lighting during the day. What paint color can I use for the ceiling? I’m looking at Cotton Balls and White Dove. Will either work? Would this color be cool enough to go with marble counters? We have picked our slabs but they aren’t installed yet. The builder needs our paint color for the whole house tomorrow and I can’t decide between a warmer gray like Edge Comb and a brighter/cooler gray like Grey Owl. Hi Mary Beth, I think you might find Edgecomb Gray a touch warm for most marbles! Hello! I have been following your ideas regarding updating carpenter grade cabinets, Formica 180, sinks, paint colors with wood trim. Let me just start out by saying how much I appreciate your ideas that do not blow the budget!! We have golden oak cabinets and trim throughout our home. Replacing is not an option. I am leaning towards using Edgecomb Gray after reading your color review. Would you be willing to recommend a Fomica 180 pattern that you like with the Edgecomb Gray that would look nice with the golden oak cabinets and updated hardware? Do you know if we can check out or rent a fan deck with available Formica 180 options? I cannot get over how good the Formica looks in your photos! Any information you can provide would be greatly appreciated! Hi Tina! I’m glad you’ve found the info helpful! The first one that came to mind was the Travertine Silver, which is beautiful. It doesn’t work AS well if you have corners as the veining meets up, but doesn’t match up on in the corners. I love your reviews and your writing style. You’re so down to earth and who doesn’t love humor! I’m wondering if there are “rules” about choosing trim and ceiling colors. For instance, if you paint the walls a warmer greige, like Edgecomb Gray, do you want to also choose a warm white for the ceiling and trim? Can you pair it with a cool white instead or does this cause some kind of discord? I guess I’m asking how choosing a stark white affects the wall color as opposed to choosing a softer white? If you’ve addressed this question somewhere, can you please direct me to it? I’m drawn to warmer, softer whites but I never know how they affect wall colors. Thanks so much and keep up the fantastic reviews! Hi Sheila, thanks for liking me 😉 I think I’m funny, but my hubby doesn’t always agree! So whites are tricky, but generally speaking if you have cool toned walls (ie: blue, purple, green, gray) you’ll want a plain white or slightly cool white with similar undertones. If you have warm toned walls (ie: warm gray, greige, yellow/orange/etc… then you would do a warm white. But of course, this isn’t set in STONE (nothing ever is with paint colours) as sometimes you can do subtle tweaks to whites to off-set/complement the wall colour. When it comes to Edgecomb Gray I like it with White Dove! Hello! Any thoughts on the use of this in a basement with minimal natural lighting? I wonder if it’s worth lightening it up a touch for use in a darker space? Love your site, thanks for sharing! Shucks. We are about to put our home on the market and we want to freshen up the barely-any-natural-light basement level and make it most marketable. I am so stuck on color, but had been leaning toward Edgecomb Gray, maybe lightened….but now I am kinda thinking SW Bug Chill based on your review of it…..Currently is Searching Blue in some places and Hilton Head Cream in others… We want to just “whitewash” the whole thing, just not white. Do you have any blogs or videos on painting your house to sell it? What are mist people looking for? Thanks for all your articles and videos….I have become obsessed with color!!!! Hah! Bug Chill…now, that’s interesting sounding! I meant SW Big Chill, of course. I love your blog! I wish you would address colors in an old house. I have found in my old home that some of the grays and tans just say -old color in an old home. the white trim color I have used that I feel Helps to give a little more up-to-date feel is Benjamin Moore’s decorators white. can you talk about this problem or have you had it ? Oh Marilyn, I would LOOOVE to talk about this problem, but you know why I can’t? Photos! I only use my own photos now of clients homes. I just don’t have enough photos of clients with older homes that I can use on my blog! Photos need to be as clear and bright as possible and hopefully the rooms are somewhat decorative. Often it’s one or the other, but not always both. It’s a tough one! So…wink wink, if you want to send some photos of your home along (if you think it could work) PLEASE DO! I would absolutely LOVE to touch on this topic! I love your color advise. I had connection problems earlier and can’t find my original post so I’m thinking it never went through. With that said, if this looks familiar it posted twice. After much searching you have guided me towards edgecomb grey for an open concept home with a 2 story north facing living room. I am trying to decide if painting one color throughout is too much grey. I’m hoping the different lighting will give it slight color variations from room to room. From the living room you can see the foyer, kitchen and sunroom. You can’t see the dining room off of the kitchen though, and it is painted functional grey with white wainscoting . 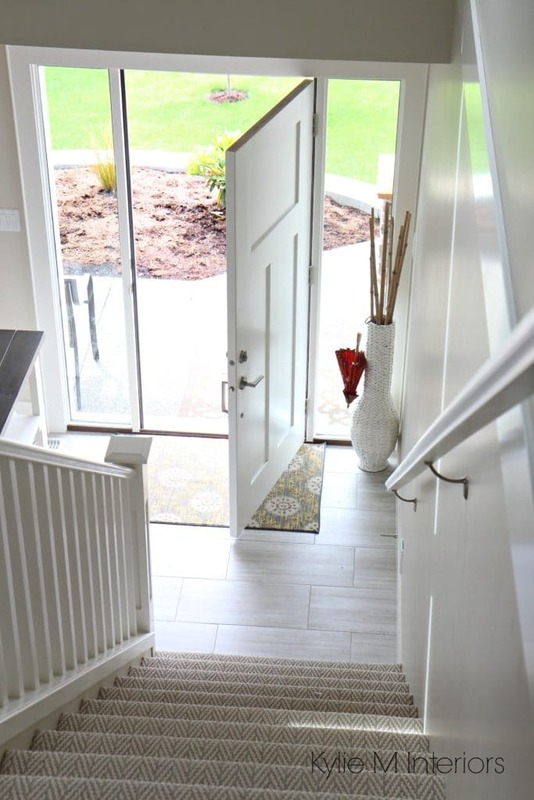 I was wondering if you think manchester tan (20 % lighter…thank you Kylie) would be a better choice for the kitchen and adjoining sunroom to break up the grey or if sticking with one color creates better flow in open concept rooms. Would those two colors compliment each other? Thank you for your insight. Hi Antoinette! I have TONS of clients how paint the same colour EVERYWHERE, knowing that the exposure, room size, furnishings, etc… will affect how the colour looks. That being said, nothing wrong with a change either! Now I always recommend lightly if I haven’t seen the rooms, but yes, Edgecomb and Manchester are nice together and i think going 25% lighter is a good idea. It sure does. Thanks so much. Hi Kylie! I’m a new fan of yours and your content has been so helpful so far! I am a bit confused about when and where to use Edgecomb Gray vs. another favorite of yours – Balboa Mist. Both seem to be warmer, lighter grays and you’re a fan of both…can you elaborate on your feelings for these two colors? Also, do they go well together or clash? Hi Sharon, I find that Balboa is a bit more feminine looking, with an almost warm purple undertone (very subtle though). Edgecomb is a bit more of a ‘typical’ greige with not too many surprises hiding in it – so for my money, I’d bank on Edgecomb! Thank you Kylie! This is very helpful! First off, I am a big fan of yours! I have been doing a town house renovation and your website has been so helpful! I also live in Nanaimo, so I am excited to connect with you when I buy/build my dream home! I also have a vaulted ceiling with a tall feature fireplace wall.. right now it is RED, so red!! I need a feature colour to pair with edgecomb gray… in a north/east facing room… Do I keep the red? or do something neutral like SW Urbane Bronze? As for a feature wall, it’s ALLLL about personal tastes! Red suits Edgecomb, but not everyone loves red. Urbane BRonze? I LOOOOOVE Urbane Bronze – dense and striking. It also depends on what best suits your decor and fireplace! I also like SW Porpoise, which is the slightly lighter version of Urbane Bronze and the green comes up just a wink more, mixed with that gorgeous dark dark greige. I hope that helps my Nanaimo friend! Hi. Kylie. I’m going to remodeling basement,I want to use Edgecomb gray for the walls. What ceiling and trim color would you suggest?My floor is Lewisburg oak. I like warm color and I want to my basement look more brighter. Would you suggest Edgecomb Gray for basement wall?thanks. Very grateful to Kylie for this excellent article about Benjamin Moore Edgecomb Grey. We were searching for a greige that was more beige than grey for our Delray Beach villa remodel, and I think we’ve found it! Thank you for doing the work for us! Awesome – that’s what I love to hear, thank you Matt! Hi Kylie, thanks so much for your blog review on Edgecomb Gray. We recently purchased our first home and I have been going back and forth on what color to paint. I have a sample of Edgecomb Gray, and have loved it. But I would like your opinion on if it will be the best color for us. I would be happy to send photos! Not sure of the directional sunlight but we have a house with only one window in the living room with a covered porch out front. The kitchen has more natural light filtering in from a large window in the dining as well as a window above the sink. ALL of our trim is wood, along with wood colored cabinets and flooring. What I have found is that the Edgecomb Gray looks almost white up against all of the wood. I want our spaces to be as light and airy feeling as possible, but still bring in some color. HI Kalynn, thank you for writing! When it comes to personal questions, there’s so much more for me to consider, so yes you’re right – photos would help! So, I would recommend you check out my E-design service which is affordable and fun! 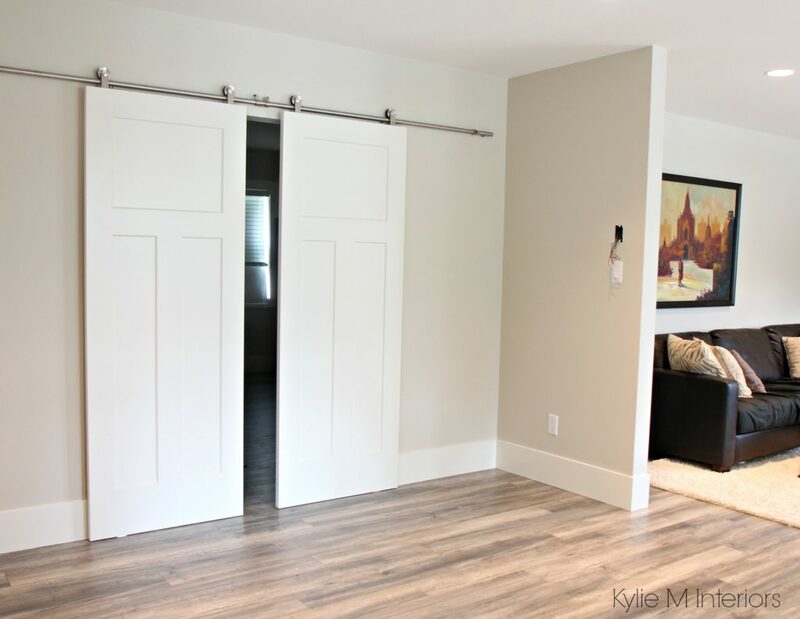 https://www.kylieminteriors.ca/online-decorating-design-services/ This way I can spend some quality time with your room, check out your photos/questionnaire answers and come up with some good solutions for you! I am painting the whole interior of my house and I’m using Benjamin Moore Aura paints. My question is I am using flat paint for the ceiling, matte for the walls and semi- gloss for the trim and the doors. I also have a built in entertainment./ bookshelf in my family room, what type of sheen would you suggest I paint that with? Hi Nancy! That does sound good, although with matte walls you MIGHT want to consider a slightly softer satin finish on the trim, but that CAN depend on the age of your home. Older homes often best suit a shinier trim, whereas more modern homes often suit more of a satin finish. AS for a built-in, I would always go satin or pearl. Can you recommend a ceiling color besides white to go with Edcomb grey walls? . Floors are oak hardwood. Hi Cindy, I might look at White Dove for a soft, warm look! Painters have started painting our house Edgecomb Gray and all I can see is lavender on our walls! They have not started the living room and kitchen yet but I would hate for those walls to look lavender as well. I would love your help but I would need a quick turn around time. Do you have the availability ?! Thanks so much!! Hi My! It could be a few things. My first thought is ‘what are they painting over?’. If it’s a warmer yellow/beige tone, then Edgecomb can look that way in comparison. My next thought is, ‘did they colour match it into a different brand, or are they using BM paint?’. Colour matches can be good…but they can also be just slightly off which can tweak those undertones. And lastly, is the room north facing? North facing light can sometimes enhance the gray in a colour. Thanks so much!! The walls were originally yellow!! The entire house was painted yellow 🙁 Between gray owl, classic gray and silver chain, which one would you recommend for kitchen walls? Our kitchen is south facing with white quartz countertops. I love revere pewter but I heard that clashes with marble/quartz. Hi Kylie, after 10 samples and still no luck I finally came across your website. Thank goodness because I was starting to lose hope on ever finding the perfect color. Every gray I used looked blue in my house. But I have finally narrowed it down to accessible beige, revere pewter and edgecomb gray after reading all your posts.. I LOVE edgecomb grey everywhere except for one area. Up high on the 2 story great room. It looks yellow.. The room is south east facing. Is that normal for that color to look yellow or is it just my house? Thanks so much! Hi, love your advice and great pictures. I am thinking about going with Edgecomb for my entry and living room. I have an open stairwell to our basement rec room and wondered if Kendall Charcoal would be a good choice for an accent wall? Great post! My husband and I just bought our first house and your site has been very helpful! Do you have a recommendation for a neutral BM color similar to Edgecomb Gray but slightly more beige? Hi Erin! Check out BM Ballet White and White Sand, see how they feel! Just found your posts in time before painting my living room, hall, up the stairs and adjacent room in 5 days ! You are the best designer blog I’ve found on the internet. I’m in an older townhouse, north facing living room with only one window , so it’s a dark and shadowed room. A designer friend insists I’ll love Revere Pewter, but the sample looks dark, gray and muddy on my walls and my local paint store said I won’t see a difference at 75%. Edgecomb looks more tan by comparison. I want a warm griege. However, my furniture, sofa, chairs and end tables, are mostly off white, creams. My first question is, would one color look better than the other with all of white/cream furnishings. Second question, what is a good complementary color for an adjacent room in the green family. Hopefully I’ll get an answer before my painter comes! I am deciding on colors for our SW facing master bedroom and bathroom. I don’t like the blue/cool undertones of Gray Owl. I also have Edgecomb Gray as a sample, which I really like, but am afraid it will feel to beige! I love Classic Gray on the swatch, but it looks white in our room. Do you have a suggestion for a warmer grey close to classic grey? I do love the looks of a clean, crisp, light color! This post has been super helpful as we navigate which color to paint our northern exposed, open concept home. Bah, who am I kidding when I say “we”? My husband has no say in this. 🙂 Edgecomb Gray and Wool Skein are the top contenders. Should I be worried about either of these colors turning boring in an open concept home with white trim? I remember you writing that sometimes Greige can get dull. We currently have Bay Sands by Valspar on the walls. LOVE how you’ve described Edgecomb Gray! You have a knack for that. 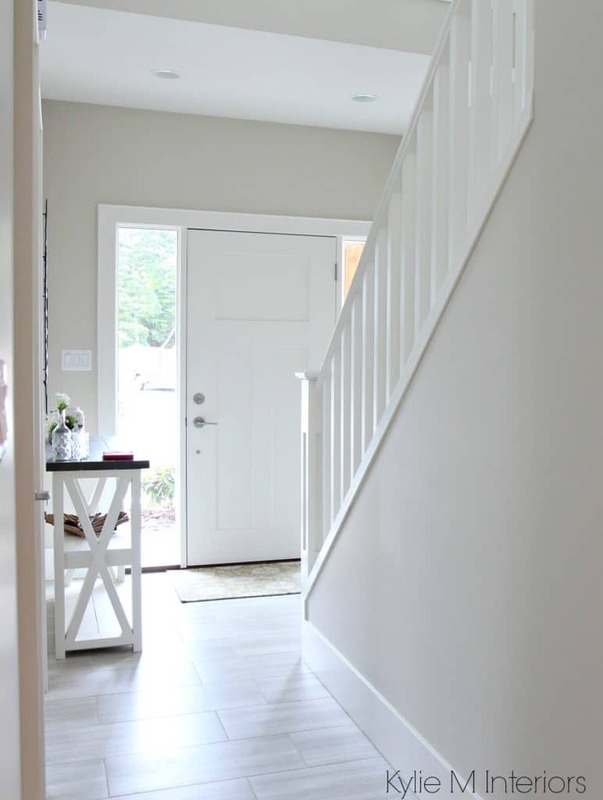 What would you suggest as a lighter accent color to the Edgecomb grey in a small foyer and kitchen. My kitchen was designed 10 years ago with dark wood cream/orange granite and terocotta floors. What are your thoughts on fog mist in comparison to edge comb grey? We just installed new Anderson wood windows and the white wood windows are slightly grey. Would decorators white work well? So many whites look too creamy and are making the window color too grey. Does Decorators white sit well with Edgecomb grey? Hi Kylie! I love all your insights and am also a huge fan of Edgecomb gray . 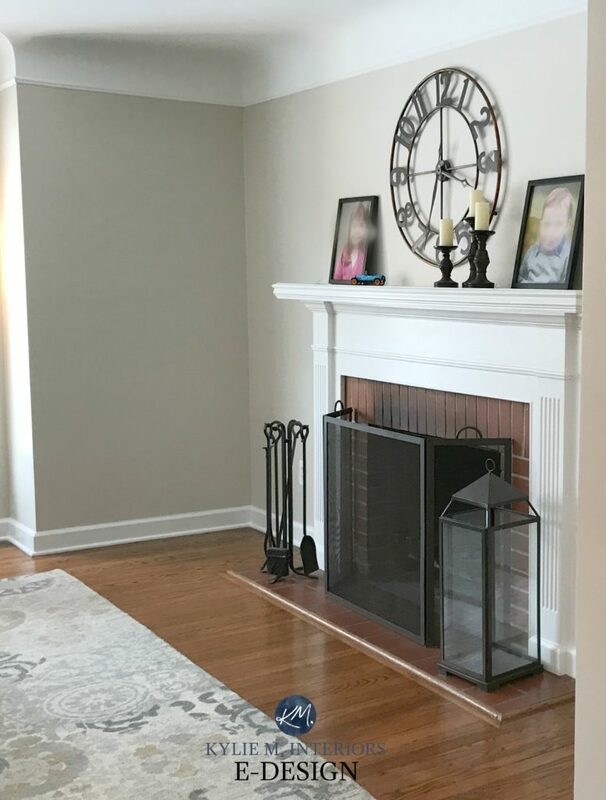 Here’s my question: before I go to the trouble and expense of painting my whole, open concept house, do you think the gray/ griege trend is coming to an end? Is a new color palette on the horizon? I don’t want my house to look dated in 5 years. Thanks for your insights! Hi Sue! I DO think the gray thing is slowly on its way out and a lot of people are swaying a bit warmer. It’s really more about what suits YOU and your home. I would imagine that in 5 years we could even see beige right back in business as the fave with the way things are going! Is there a similar color to Edgecomb Gray in Behr brands? Hi Jennifer, unfortunately at this time I’m only focusing on Bm and Sw and aren’t familiar with the colours in Behr!